Learning Resources Pretend & Play Camp Set Just $9.74! You are here: Home / Great Deals / Amazon Deals / Learning Resources Pretend & Play Camp Set Just $9.74! Prime Members – stop in at Amazon today for this exclusive deal. Get the Learning Resources Pretend & Play Camp Set for Just $9.74! This is the lowest price Amazon has had on this highly rated set! Pretend & Play Camp Set is perfect for outdoor adventures! Little campers can light their way in the dark or cook up the catch of the day. 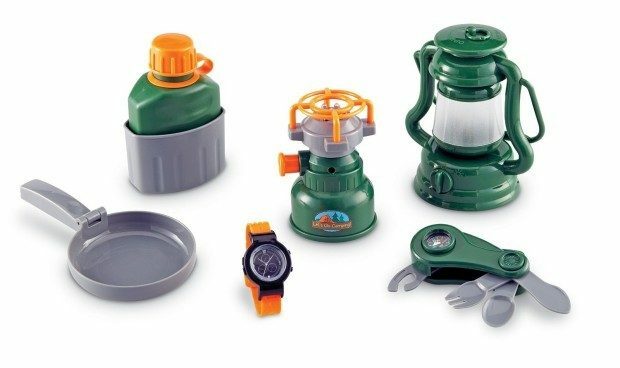 Utensil set with compass, battery-powered pretend stove and other authentic-looking components make play even more realistic.